High speed rotary agitator brush cleans and grooms carpeting, steps, upholstery, and auto interiors. Fits all standard portables and built-in vacuum systems. The Rug Rat high speed turbine power agitator brush operates by vacuum and requres no batteries or electric power cords. If you’re looking for the power and convenience of the Turbocat in a handheld powerbrush, you’ve found it in RugRat®. The RugRat is an all-purpose, turbine power vac attachment that cleans and grooms carpeting, steps, upholstery, auto interiors and picks up pet hair quickly. It fits all standard portables and central vacuum systems. Best of all, batteries and additional electrical cords aren't required. The RugRat is an all purpose, turbine power vac attachment that cleans and grooms carpeting, steps, upholstery, auto interiors and picks up pet hair quickly. It fits all standard portables and central vacuum systems. Best of all, batteries and additional electrical cord's aren't required. The RugRat hand-held turbine powerbrush is lightweight, powerful and perfect for stairways, auto upholstery, furniture and other small places. It features the exclusive TurboFlex agitator, which gives you the same powerful cleaning performance as the Turbocat in the form of a highly portable attachment. The RugRat operates by vacuum and requires no additional electricity, cords or batteries. This means it is less costly to buy and install and easier to use than its electric equivalent. This rotary brush agitates carpet fibers so that embedded dust, dirt and pet hair can be vacuumed away. It rejuvenates carpet and upholstery nap that has become crushed and worn. RugRat’s lightweight design makes it portable enough to clean in every room of your home. Its small, low profile design can fit in even the tightest spots. Why prolong the cleaning if you don’t have to? 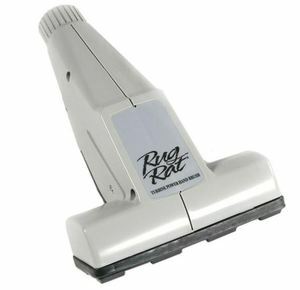 RugRat’s 6-inch wide sweep and multi-port edge cleaning saves time and effort. The RugRat fits all standard 1 1/4” wands, and is compatible with central vacuums as well as most portable vacuum cleaners.